Who knew a bowling alley could be so controversial? 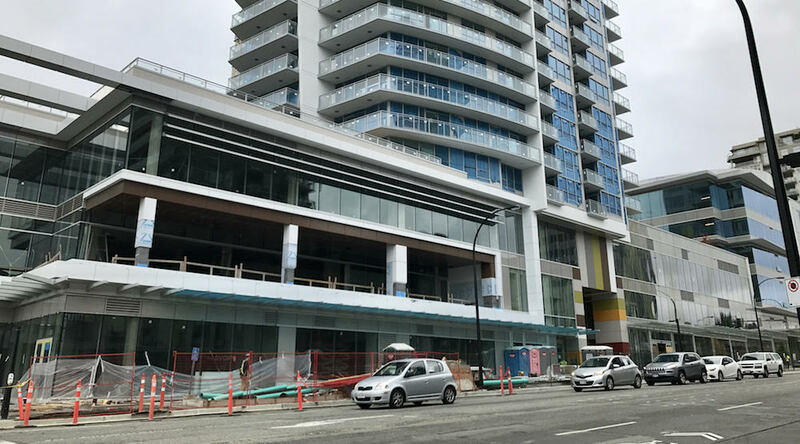 The City of North Vancouver will have a new bowling alley following a contentious 4-3 vote by City Council earlier this week that narrowly approved a bowling alley for CentreView, an under-construction mixed-use commercial and residential tower development at 1308 Lonsdale Avenue. A 7,884-sq. ft. underground site at the southwest corner of the building is now slated to become a family-friendly bowling alley with six regulation-size, 10-pin lanes and up to five pool tables. It will also serve cafe and pub-style food, and a separate application will be made at a later date for a liquor license. In earlier Council meetings and a staff report, there were allegations that Onni Group, the project’s developer, over excavated or accidentally excavated its development site, but a representative with the company rejected that claim during this week’s public hearing. The space was originally planned to be used for commercial parking, and it was later reverted to commercial space storage after the building’s plans were reviewed to better optimize the floor plate usage. A real restate agent for the prospective tenant, the operator of the bowling alley, also said they were engaged in a 12-month hunt for suitable bowling alley site, but it was challenging to find a site that was both financially feasible and had zoning that permitted a bowling alley. In exchange for the usage, Onni Group will pay $275,940 to the municipal government, which will go towards the Civic Amenity Reserve Fund. A public consultation process on the proposed usage began more than half a year ago, although both the municipal government, the developer, and tenant were not required to do so. Two residents who had bought into the building and were against the bowling alley were the only public speakers at the public hearing. “Bowling is fine but I do not want to live above a bowling alley or pool hall or whatever goes down there,” said future resident Robert Dickinson, adding that residents were not informed of a bowling prior to purchase. Robert had to be escorted out of Council chambers by security after he attempted to interrupt other Council deliberations following the vote that green-lighted the project. Their comments were also countered by several Councillors and Mayor Darrell Mussatto, who said the bowling facility on 141 West 3rd Street is not known to cause problems. City staff also clarified that noise would not be an issue as two floors of retail, including a Whole Foods store, and office will separate the tower’s first level of residences from the subterranean bowling alley. Councillor Linda Buchanan reasoned that her support for the bowling alley revolved around the need for more amenities and activities for younger generations in the community. “I have spoken to a number of young people who live in our city, and I’m not talking about 15 year olds. I’m talking about 25 to 45 year olds who actually want to do other things besides sit at restaurants or at a bar and drink, and they go to downtown to do those activities,” said Buchanan.